And I find this "Name Number" quiz kinda interesting, especially when I tried out different combinations. Life is meant for versatility and flexibility, right? :D By the way, this quiz can be found in Facebook. In this quiz, you should key in your birth name. 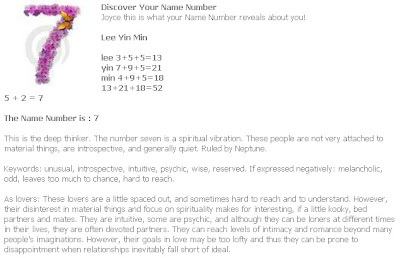 My birth name is Lee Yin Min and the number generated for it is 7 - The Deep Thinker. Explanation as per screenshot below. 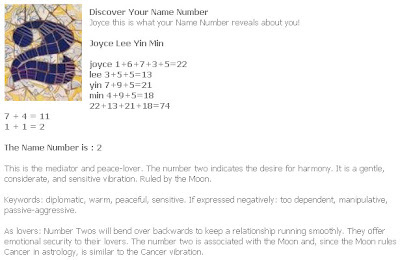 Then, if I key in Joyce Lee Yin Min, I'll get number 2 - The Mediator & Peace Lover. 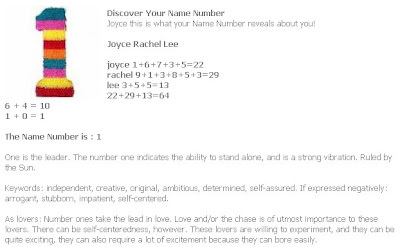 If I key in Joyce Rachel Lee, I'll get number 1 - The Leader. 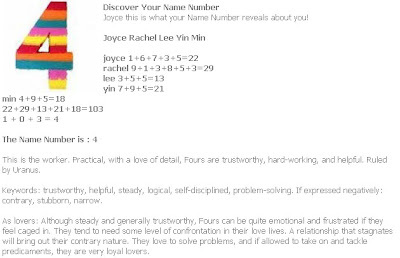 If I key in Joyce Rachel Lee Yin Min, I'll get number 4 - The Worker. Well, I'll stick to number 7 because that's from my birth name. Can buy number liao from 1, 2, 4, 7.